Tottenham Hotspur have identified Atletico Madrid ‘keeper Sergio Asenjo as the player they want to provide cover/competition for their current first-choice stopper Heurelho Gomes, but it seems Spurs may now find a couple of fairly large obstacles standing between them and their man – namely Spanish giants Barcelona and Real Madrid. 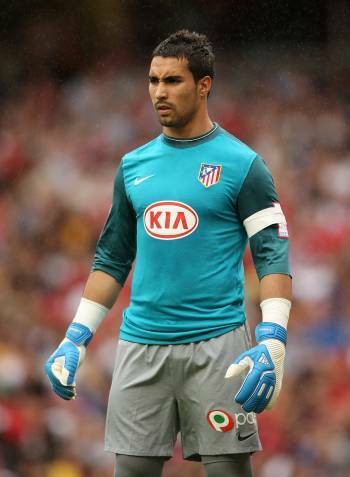 Atletico paid Read Valladolid €6 million for Asenjo last summer, but the highly-rated young keeper has been displaced by teenage sensation David de Gea in the pecking order at the Vincente Calderon Stadium and is now said to be seeking a transfer. Spurs are reportedly ready to effectively give Atletico their money back to bring Asenjo to White Hart Lane, but both Barca and Real Madrid are also keeping tabs on the 20-year-old stopper, as both clubs see him as perfect cover for Victor Valdes and Iker Casillas respectively.